China Daily journalist CHEN JIA was trapped for hours in a crushed minibus which was buried under rubble and was hanging on the edge of a cliff moments after Monday's earthquake shook Sichuan. Chen, 25 - who was on a media trip to Wolong Nature Reserve and was on her way back to Dujiangyan - describes her ordeal to colleague XIE FANG from her hotel in Chengdu, where she is recuperating. Our vehicle was suddenly pummeled by falling rocks soon after we crossed the Baihua Bridge - and when we turned back to look, it collapsed. I and seven others were trapped in the minbus which was buried under boulders and close to the precipice. For the next three hours, I prayed for my life. My nose was pressed close to the floor of the wrecked vehicle and I found it hard to breathe. Thanks to the efforts of three local people, I am alive to tell this story. I am very lucky to survive this terrible disaster - at least I am still alive. At 2:28 pm, we were on our way back to Dujiangyan, when our minibus was struck by a massive rock. At first, we thought it was a mudslide rather than an earthquake. But the local driver knew better - he soon abandoned the vehicle without informing any of us. There were eight passengers, including three women, from various media such as CCTV, Beijing Evening News and Zhejiang TV Station. An avalanche of rocks then rained down on our minivan, flipping it upside down and pushing it to the edge of a ravine. A river ran below. I was jammed between the vehicle's back seat and my laptop, and couldn't move at all. All of us were in shock but soon started to encourage one another. To distract our minds from the desperate situation, we chatted - and everyone promised not to cry. One of the reporters recorded our conversations on her mobile phone. My head was hanging down and became swollen. I could feel a male journalist, whose back was against mine, breathing painfully. I kept talking to him but my voice was getting weaker and weaker. After three hours, I could not hear any of the conversations inside the vehicle. I could not see any light at the end of the tunnel. I was extremely desperate. When all hope was lost, three local heroes arrived on the scene - an ethnic Tibetan, who managed to steer his car away from the falling rocks, and two ethnic Qiang men, who were transporting vegetables to the Dujiangyan city market. Our minibus was nearly buried under rocks, but they managed to pry open a small hole in the cabin by using an iron bar and tree branches. The three saviors pulled us out one by one. It was the third time the Tibetan man helped save people's lives that day, he told me later. He dragged us, one after another, to a safe place, while rocks kept falling. As I was dragged from the van, my clothes were torn and I was left wearing nothing but my underwear. A male journalist took off his clothes and gave them to me to protect me from the cold and rain. We could not call anyone because the phone system broke down. At about 7 pm, our group, which now included the rescuers, found an empty bus parked nearby and we stayed in the vehicle overnight. We took turns to watch out for more fallings rocks and snakes, which had been disturbed by the quake. I heard rocks all the time, and it didn't feel safe at all in the bus. The next day, we relocated to the banks of a river. We used seat covers as blankets and picked up vegetables, which had spilled on the road from the vendor's vehicle. Later we met a group of local villagers on their way to Wenchuan, the epicenter of the quake, to help with the rescue effort. 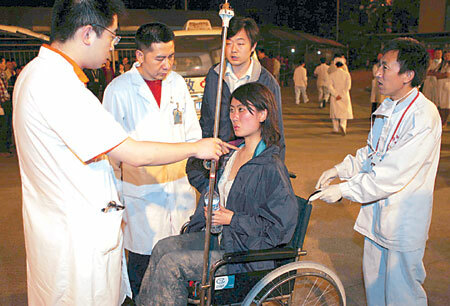 They were eager to help people trapped under rubble, and could not help us get back to Dujiangyan. On Wednesday morning, we decided to take the risk of walking, and the journey took nearly nine hours. We left behind three severely injured members of the group - and I broke my promise and cried as I waved goodbye. On the long march, our group, led by the Tibetan man, linked hands as we trekked the steep and muddy mountain path. During the journey, I was exhausted and wondered whether I would survive. Nobody had food or water for 2 days, but I refused to give up. If I loosened my grip, other people's lives would have been at risk, so I held on and made up my mind to push on, even if I ended up crawling. We eventually arrived in Dujiangyan, and doctors sent our group to Chengdu by ambulance. My neck was injured but luckily, not seriously. The three people left behind have also been rescued.